In the Wildcard Functions window, scroll down and click the fileLink function. The wildcard is then inserted into the editor and wrapped in the modifier function. At runtime, this value will be replaced with the link to your file. In the Wildcard Functions window, scroll down and click the showImage function. In the showImage function window, you can force the width and height of the image or leave it on auto to show it at full size. 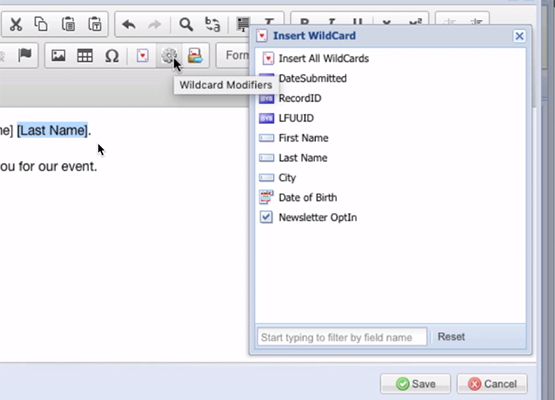 The wildcard is then inserted into the editor and wrapped in the modifier function. At runtime, this value will be replaced with the image that was uploaded. The fileLink modifier simplifies the process of linking to an uploaded file. In some case you may want to link to an uploaded file manually. This can be useful to link to a file within a Free Text Element on a form, or to reference a file uploaded from an alternate form. The steps to get the full path to an uploaded file are below. Finally, append the wildcard that holds the uploaded file name to the path. You can use this path in an IMG SRC tag, or an EMBED tag to show an image or show a PDF for example.